Don’t let your readers get lost in the timing of your scenes. They might stop reading. If you write a novel that takes place over weeks, months, or years your story will be stronger if you keep track of when scenes are occurring. This will be important to help you focus on anchoring the reader when the date or time changes. The obvious thing one thinks about when considering timing in a novel is the time of day, the day of week, or a specific date, but there are other elements to consider when thinking about the timeline of a story. Check if your scene is anchored in time within the first few paragraphs of each scene. This is the opening scene of my novel Descent as seen in Fictionary. To keep track of how I’m handling timing in each scene, I use the Anchored element to remind to me check this. ​I’ve checked that the time is anchored and clicked the box above Scene Time under the PLOT tab. I go through my entire manuscript scene by scene, and once I finish, I use the Story Map report to see how many scenes I anchored and where I need to go back and rewrite the scene. 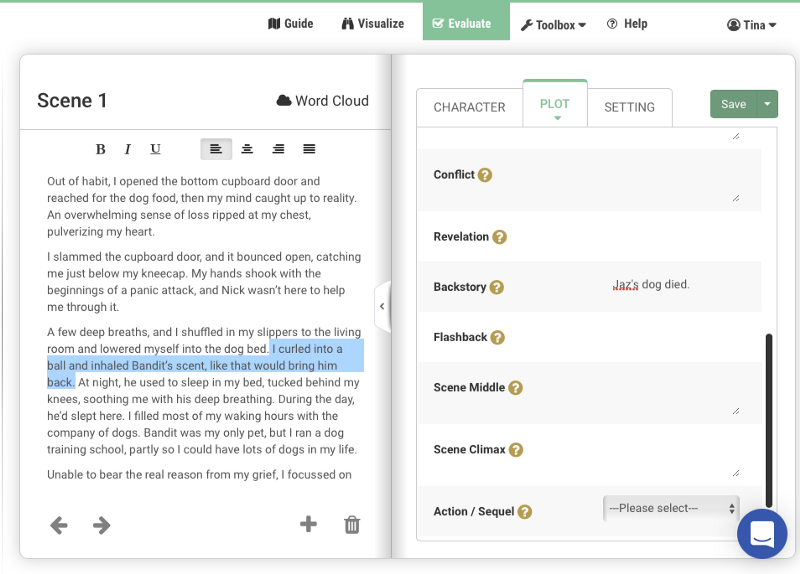 In Fictionary, you can also rewrite the scene at the same time as you’re evaluating it. As the author, you must decide when and how often to give backstory. Backstory is the story that happens before your novel begins. Sometimes during the story, you need to inform the reader of something that happened earlier in the life of a character. In Fictionary, you can keep track of backstory that your reader is aware of. You may have files upon files of information you store elsewhere that you use to develop your characters, but what we’re concerned with in Fictionary is what the reader learns. 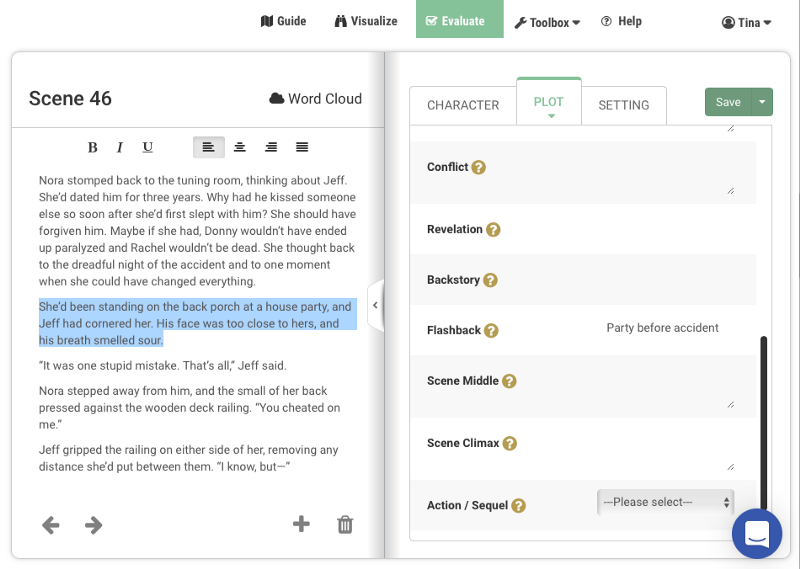 To see the backstory key element of fiction under the PLOT tab on the evaluate page, turn on the advanced mode. You’ll find the toggle under the Toolbox drop-down menu. In no more than a few sentences, enter the backstory that is included in the scene you’re working on. You can see in my work-in-progress above, I let the reader know Jaz’s dog died. This happened before the story opens, so it’s backstory. By keeping track of the backstory you can decide if you’ve started your novel in the right place. If you have more backstory than current story, you may want to start your novel earlier in the character’s life. Good backstory is the story that hurts your characters before page one. The backstory can create motives or character flaws. You may be writing a novel that is over half backstory. In this case, you’ll be using a technique where you bounce between the present and the future. Fictionary will show you if you’ve given the present and past a fair balance. If you’re writing a novel with a small amount of backstory, then you don’t want too much backstory early on in the manuscript. Only dole out the information as the reader needs to learn it. Fictionary will give you the ability to track how early and how much backstory you share with your reader. You don’t want to give too much backstory at one time. This can cause the reader to lose interest in the story if they are jarred out of the immediate story. You should only tell the readers what they need to know about the backstory and not a word more. Ask yourself, does the reader need this information? If the answer is no, then cut it from your story. If the answer is yes, ask yourself if the reader needs the information in the current scene or can you move it to later. Your characters need to do something interesting before too much backstory is included. One final thought on backstory. Curiosity is what drives the reader forward. If your character has a past that’s driving their motivation, then don’t tell the reader too soon. Keep the reader curious. A flashback takes the reader from the current time to a previous time. This usually happens quickly, and then the reader is returned to the present. A flashback is different from backstory in that it’s told as an action scene and not narrative. A reader lives a flashback is if it were a regular scene. Flashbacks can be a sentence, a paragraph, a scene, or an entire chapter. The importance of a flashback should influence its length. So look at each flashback and ask yourself how important is it to the story. This is where the rewrite comes in. You may have a flashback in which a murder occurs, and the murder is the driving motive for your protagonist in this story. In that case, you should give the flashback time to develop on the page. Don’t shortchange your reader with only a few sentences. Remember a flashback is a scene. It must be immediate. It must have conflict or tension. You are taking the reader out of the story and into the past, so make it worth it. The following is a flashback scene in my novel Descent. I’ve highlighted the transition into the flashback. For this scene, in the Flashback I entered “Party before accident.” This is enough to remind me what the flashback is about. 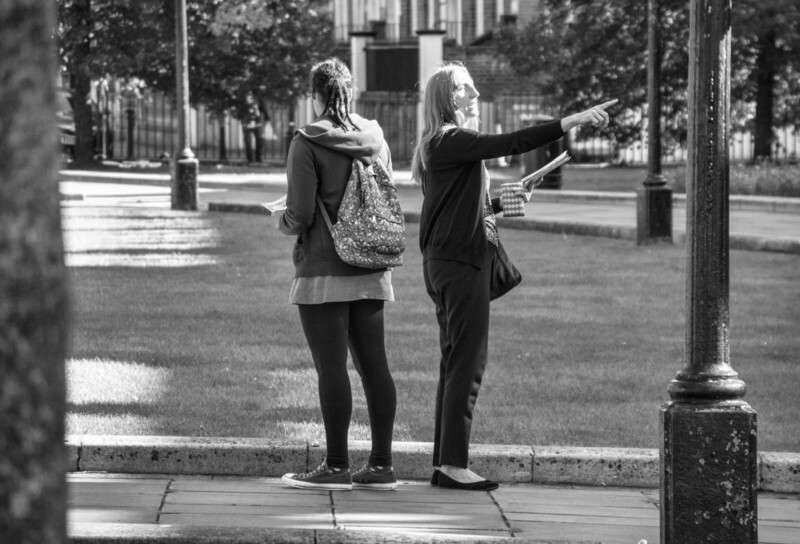 When you are revising your flashback, check how you got into and out of the scene. Did you give the reader a clue you were jumping back in time? How to you let them know you are back in the present. You can use an object to do this. An object in the present can trigger a character to think about something in the past, and that’s your transition into the flashback. Evaluate if the flashbacks are clustered together or spread through the story. If too many flashbacks occur close together, maybe they could be repositioned or grouped into one flashback.